Home › Investing › How Do I Buy Stock In Amazon? Most investors think of Amazon as an online retailer with low margins and a high price-to-earnings ratio. But Amazon is so much more than an online shopping destination. These days Amazon is a goliath in not only retail but also in cloud computing, logistics, consumer technology, and media and entertainment. Amazon AWS, its cloud business, generates scintillating margins. Its Echo device and Alexa AI assistant has been a huge hit with consumers. Approximately 1 in 2 U.S. households has a Prime membership. And some Wall Street analysts project Amazon will mushroom higher at an astonishing 16% compounded annual growth rate thru 2025. In spite of the lofty projections, Amazon has had its fair share of flops in the past. Famously, its Fire phone fizzled out and it has lost tens of millions by investing in failed startups like Kozmo.com. But overall the company has thrived to make Jeff Bezos the richest man in the world (depending on what day you look) and continues to disrupt a wide variety of industries from book publishing to grocery stores. So is Amazon stock worth buying or is time to sell, sell, sell? To assess the merits of buying Amazon stock, we can crunch valuation figures and analyze its corporate strategy using quantitative and qualitative research. Amazon is a notoriously difficult company to value because it defies conventional wisdom by keep margins razor thin, especially in its online retail segment. Generally, what we find is the longer term ten year forecasts lead to higher share price projections compared to shorter term 5-year estimates. And it’s no surprise that EBITDA and revenue multiple calculations for Amazon lead to share price estimate that are approximately half of what the discounted cash flow forecast models project. Below, you can compare Wall Street analysts’ consensus share price estimates with the estimate arrived at using theoretical valuation models. Amazon’s acquisitions are not limited to the U.S. It snapped up Souq, the “Amazon of the Middle East”, in 2017 for between $650M → $750M. This acquisition opens up Amazon to markets in Saudi Arabia, Egypt, and the United Arab Emirates. Acquisitions will clearly play a big part in Amazon’s future growth strategy following the launch of its Alexa Fund which has a war chest of $100M and a laser focus on companies related to the internet-of-things and voice technology. 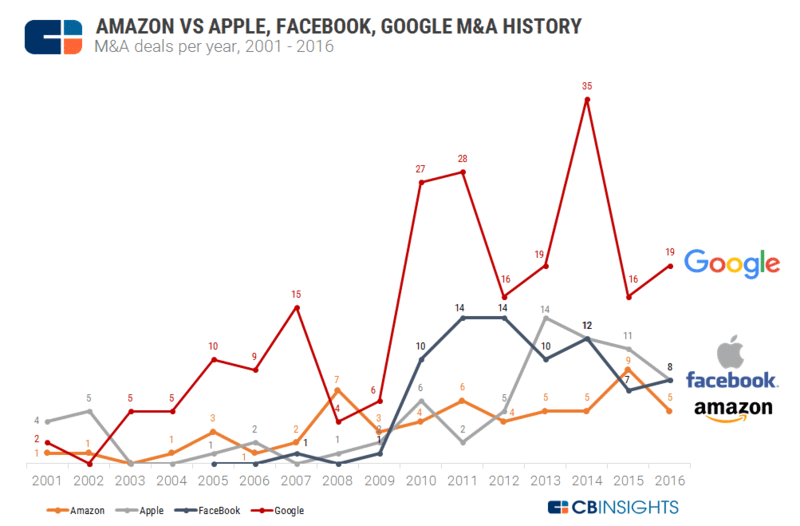 It’s notable that rival tech leader Alphabet invests much more aggressively in a wide variety of companies while Apple shies away from acquisitions unless it can own a company outright – similar to Facebook’s acquisition strategy (e.g. WhatsApp and Instagram). You can clearly see where Amazon expects future growth to come from when it comes to its Alexa Fund acquisitions: instructing devices to respond to your voice commands. Perhaps the scariest prospect for companies is the idea of Amazon entering its market. Until Amazon purchased Whole Foods, the idea of it becoming a heavyweight in the grocery industry might have seemed far-fetched. And until Amazon launched Prime Video, the thought of it competing with Netflix to stream entertainment content and produce original shows seemed hard to imagine. But Amazon has a knack for shocking incumbents with bold moves, and one burgeoning opportunity is in the healthcare industry. Amazon invested in biotech start-up GRAIL, which concentrates on genomics for cancer diagnosis. A gene sequencer called Illumina has already spun out from GRAIL and complements Amazon’s AWS well because of the computing power needed for genomic sequencing. 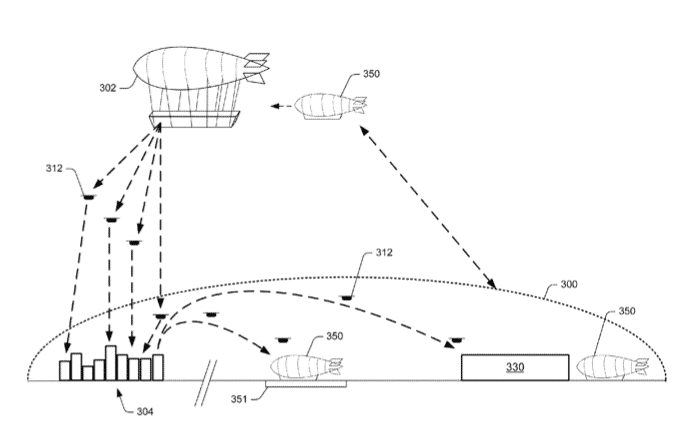 Among Amazon’s most ambitious bets for the future is its investment in drone delivery technology. Perhaps Amazon is simply protecting its brand name from trolls or maybe it’s a sign of greater ambitions to take cryptocurrency payments in coming years. Amazon’s share price has soared since it went public with gains of 35,000% over a couple of decades, but what is next? Amazon stock is notoriously volatile. Because the company spreads its wings so far by attacking a diverse group of industries, it has its share of hits and misses, causing both euphoria and dismay among investors. “I very frequently get the question: ‘What’s going to change in the next 10 years?’ And that is a very interesting question; it’s a very common one. And I submit to you that that second question is actually the more important of the two — because you can build a business strategy around the things that are stable in time. … in our retail business, we know that customers want low prices, and I know that’s going to be true 10 years from now. They want fast delivery, they want vast selection. If you look over a ten year period, you will see wild swings in share price, but perhaps investors can derive some comfort knowing some things will remain constant: low prices, fast delivery, and vast product selection. Even if you were to examine Amazon stock over any one year period, you would see a share price that has had its fair share of volatility, a representation of the struggle investors experience when attempting to accurately value a company with so many moving parts. As an online retailer, Amazon was famous for delivering low earnings figures quarter after quarter but thanks to its cloud computing division, margins look better. When Amazon started out in 1995, Jeff Bezos raised almost $1,000,000 from a handful of early investors. Just one year later, Bezos sold a 13% stake to Kleiner Perkins Caufield & Byers for $8 million, which valued Amazon at $60 million. And a year after that Amazon went public at a valuation of $381 million. In the next few decades, Amazon stock skyrocketed 35,000%, not least because of stunning revenue growth. Total historical revenue growth across its entire business operations has been phenomenal over time. When revenues grow so quickly it sometimes takes time for earnings to catch up. But as an online retailer, earnings never really have caught up to revenues, causing investors to scratch their heads as to how best to value a company growing so fast yet not turning much of a profit. These days, Amazon AWS delivers such high margins that the company as a whole is likely to experience earnings grow at a rapid pace over the next decade – unless Bezos deploys profits back into new ventures. When you take into account the amount of capital invested, ROIC measures the profitability and value-creating potential of Amazon. Great companies sustain value creation over time and that is demonstrated through high returns on invested capital. You can think of return on invested capital, or ROIC, as a gauge of whether the company is generating a return for its shareholders and bondholders. Amazon’s ROIC is slightly lower than investors might expect given the extraordinary value creation reflected in its market capitalization. But it’s not really a surprise to see that just as Amazon confounds investors when it comes to earnings so too does it challenge investors when it comes to ROIC. Because Amazon invests so heavily, it is no surprise to see that the returns to-date on those investments are lower than investors might wish. Investors will just have to wait and see whether Amazon can turn its investments into higher returns on capital in the decades to come. Amazon has comparatively low debt levels but Amazon’s core business as an online retailer may suffer in terms of revenues during tough economic periods. 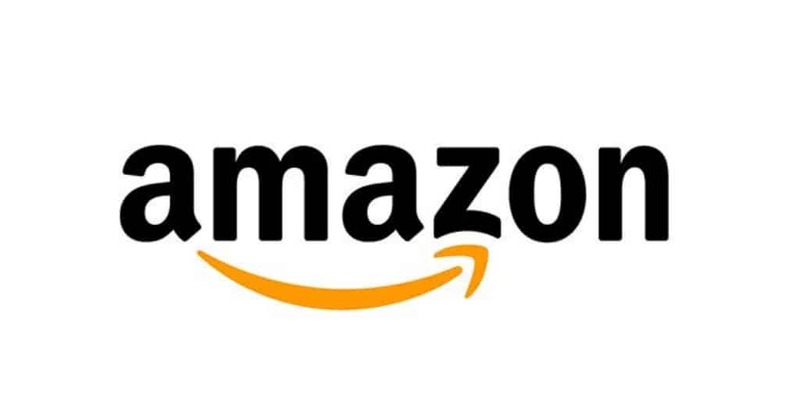 Unlike debt-laden companies that increasing struggle when interest rates rise following a Fed rate hike, Amazon has very little debt overall and should face no real hurdles from its financial obligations during higher interest rate environments. However, Amazon reaches approximately 1 in every 2 U.S. households, who are on the whole heavily indebted, and so the likelihood is they will need to tighten spending during periods of economic recession, and this in turn may affect Amazon’s revenues. Weighted average cost of capital, or WACC, is a measure of how much it costs a company to raise capital from its stakeholders. Shareholders and bondholders demand a yield, and the combined return is captured in the Amazon WACC. Imagine for a moment that Amazon needed to raise $1 billion from its shareholders and bondholders, 50% from each. If lenders expected a 4% return and shareholders demanded a 10% return, the WACC would be 7%. So, Amazon would need to generate at least a 7% return to keep both debt and equity holders happy. >> How Much Should I Save For Retirement? ‹ How Do I Buy Stock In Alphabet (GOOGL)?